Eiji Toyoda was a former chairman of Toyota Motor Company. His family-run business made revolutionary changes in the way automobiles were made. Eiji Toyoda, the man who was in the driver's seat of the Toyota Motor Company for over 25 years, is virtually unknown outside of Japan's Toyota City, headquarters of "the company that stopped Detroit, " according to the New York Times. But like a latter-day Henry Ford, Toyoda made his mark on the auto industry. He not only presided over revolutionary changes in the way cars are built, he saw his family-run business become a powerhouse in the world export market and has forged an unlikely alliance with an archrival, General Motors Corporation. Although he resigned his post as chairman in 1994, he continues to hold the title of honorary chair of the company. As the head of one of the most powerful industrial clans in a nation of 120 million people, Toyoda had an almost Western flair as a go-getter and an empire builder that belies his reputation in Japan as a staunch political and economic conservative. The parallels between the Fords and the Toyodas extend from the assembly line to the board room. Until his retirement, the elder Toyoda shared power with his cousins: Shoichiro, who is president of Toyota Motor Corporation, and Shoichiro's younger brother Tatsuro, head of New United Motor Manufacturing Incorporated, the Toyota-GM joint venture headquartered in Fremont, California. Toyoda's uncle, Sakichi, founded the original family business, Toyoda Automatic Loom Works, in 1926 in Nagoya, about 200 miles west of Tokyo. Sakichi's son, Kiichiro, established Toyota Motor Company in 1937 as an affiliate of the loom works. The family was so involved in the business that Eiji's father Heikichi (younger brother of Sakichi) even made his home inside the spinning factory. "From childhood, machines and business were always there right in front of me, " Eiji Toyoda said in an interview in The Wheel Extended, a quarterly review published by his company. "By seeing the two together, I probably developed an understanding of both, from a child's point of view." Toyoda has described himself as a combination engineer-administrator: "I don't really think of myself as an engineer, but rather as a manager. Or may be a management engineer. Actually, I graduated from engineering school, but more important is the work a person accomplishes in the 10 or 15 years after school." What Toyoda accomplished for Toyota Motor was dazzling success at a time when Detroit automakers were struggling to stay profitable. Toyota, Japan's number one automaker, spearheaded the tidal wave of small, low-priced cars that swept the United States after successive energy crises in the mid-and late-1970s. Enraged by the invasion of Japanese imports, Toyoda's counterpart at the Ford Motor Company, then-chairman Henry Ford II, vowed, "We'll push them back to the shores." It never happened. Instead, Ford and his lieutenants turned to Toyota to negotiate a possible cooperative venture in the United States—an unsuccessful effort that preceded GM's historic agreement in 1983 to jointly produce Toyota-designed subcompacts at an idle GM plant in Fremont. In addition to running the largest corporation in Japan—and the world's third largest automaker, behind GM and Ford—Toyoda has overseen the development of a highly efficient manufacturing system that is being copied worldwide. It "represents a revolutionary change from certain tenets of mass production and assembly-line work originally applied by Henry Ford, " wrote New York Times Tokyo correspondent Steve Lohr. In short, Toyoda's career could be said to echo the company's U.S. advertising slogan: "Oh, what a feeling!" After graduating in 1936 with a mechanical engineering degree from the University of Tokyo—training ground for most of Japan's future top executives—the 23-year-old Toyoda joined the family spinning business as an engineering trainee and transferred a year later to the newly formed Toyota Motor Company. The company was a relative newcomer to the auto business in Japan. The country's first car, a steam-powered vehicle, was produced just after the turn of the century, followed in 1911 by the introduction of the DAT model, forerunner of Datsun/Nissan, Toyota's nearest rival today. The Toyoda family patriarch, Sakichi, the son of a poor carpenter, had invented the first Japanese-designed power loom in 1897 and perfected an advanced automatic loom in 1926, when he founded Toyoda Automatic Loom Works. He ultimately sold the patents for his design to an English firm for $250, 000, at a time when textiles was Japan's top industry and used the money to bankroll his eldest son Kiichiro's venture into automaking in the early 1930s. Numerous stories have sprung up over the years concerning why the auto company was named Toyota rather than Toyoda. A Business Week article claims the family consulted a numerologist in 1937 before establishing its first auto factory: "Eight was their lucky number, he advised. Accordingly, they modified their company's name to Toyota, which required eight calligraphic strokes instead of ten. Sure enough, what is now Toyota Motor Corp. soon became not only the biggest and most successful of Japan's automakers, but also one of the most phenomenally profitable companies in the world." But a New York Times story notes the family changed the spelling in the 1930s because "it believed the sound [of the new name] resonated better in Japanese ears." After Eiji joined the family business in 1936, he worked on the A1 prototype, the forerunner of the company's first production model, a six-cylinder sedan that borrowed heavily from Detroit automotive technology and resembled the radically styled Chrysler Airflow model of that period. During those early years, Toyoda gained lots of hands-on experience. "I tried in the past to see how much I could really tell by touch, " he said in The Wheel Extended. In this spare time, Eiji Toyoda studied rockets and jet engines and, on the advice of his cousin, even researched helicopters. The war left Japan's industry in a shambles, and the automaker began rebuilding its production facilities from scratch. Recalled Toyoda: "Everything was completely new to us. Design and production, for example, all had to be started from zero. And the competitive situation allowed for not even a single mistake. We had our backs to the wall, and we knew it." But while Kiichiro Toyoda was rebuilding the manufacturing operations, Japan's shattered economy left the company with a growing bank of unsold cars. By 1949, the firm was unable to meet its payroll, and employees began a devastating fifteen-month strike—the first and only walkout in the company's history—which pushed Toyota to the brink of bankruptcy. In 1950, the Japanese government ended the labor strife by forcing Toyota to reorganize and split its sales and manufacturing operations into separate companies, each headed by a non-family member. Kiichiro Toyoda and his executive staff resigned en masse; Kiichiro died less than two years later. Eiji Toyoda, meanwhile, had been named managing director of the manufacturing arm, Toyota Motor Company. In what some automakers must view as a supreme irony, he was sent to the United States in 1950 to study the auto industry and return to Toyota with a report on American manufacturing methods. After touring Ford Motor's U.S. facilities, Toyoda turned to the task of redesigning Toyota's plants to incorporate advanced techniques and machinery. Returning from another trip to the United States in 1961, only four years after the establishment of Toyota Motor Sales USA, a prophetic Toyoda told employees in a speech recorded in a company brochure: "The United States already considers us a challenger…. But we must not just learn from others and copy them. That would merely result in being overwhelmed by the competition. We must produce superior automobiles, and we can do it with creativity, resourcefulness and wisdom—plus hard work. Without this … and the willingness to face adversity, we will crumple and fall under the new pressures." In 1967, Toyoda was named president of Toyota Motor Company—the first family member to assume that post since Kiichiro resigned in 1950. 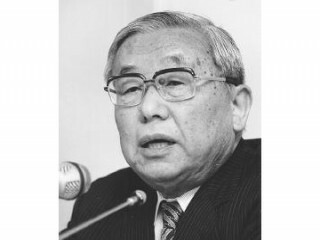 The family power wasn't consolidated until 1981, when Sadazo Yamamoto was replaced as president of Toyota Motor Sales by Shoichiro Toyoda, son of Kiichiro and nicknamed the "Crown Prince" by the Japanese press. A year later, the two branches of the company were unified in the new Toyota Motor Corporation, with Eiji Toyoda as chairman and Shoichiro Toyoda as president and chief executive officer. A Business Week article at the time quoted a Japanese economist as saying the return of the Toyoda family to power was a "restoration of the bluest of blue blood." At this stage of the company's history, there may be a strong family presence (after a stretch of non-family leadership for most of the postwar period), but not "control" in the Western sense. The top three family members own just over one percent of Toyota Motor stock, according to Britain's Financial Times. In contrast, the Ford family in the United States controls 40 percent of the voting power in the Ford Motor Company. The Toyodas led their company to a record year in 1984. Toyota sold an all-time high 1.7 million vehicles in Japan and the same number overseas. Profits peaked at $2.1 billion for the fiscal year ending March 31, 1985. While that performance would certainly earn Toyota a mention in automotive history books, Eiji Toyoda and his company may be better remembered for a distinctive management style that has been copied by hundreds of Japanese companies and is gaining growing acceptance in the United States. The Toyota approach, adopted at its ten Japanese factories and 24 plants in 17 countries, has three main objectives: Keeping inventory to an absolute minimum through a system called kanban, or "just in time, " insuring that each step of the assembly process is performed correctly the first time, and cutting the amount of human labor that goes into each car. Despite the predominance of robots and automation at Toyota, the company firmly believes in the principle of lifetime employment; displaced workers are not laid off, but frequently transferred to other jobs. Toyoda believes the day when robots totally replace humans is a long way off. He told The Wheel Extended: "At the current stage, there is a greater difference between humans and robots than between cars and magic clouds. Robots can't even walk yet. They sit in one place and do exactly as programmed. But that's all. There is no way that robots can replace all the work of humans." Due in part to that sort of philosophy, it's not surprising that company loyalty is so high. Toyota's 60, 000 employees in Japan, for instance, are encouraged to make cost-cutting suggestions, an idea that Eiji Toyoda borrowed from Ford after his first visit to the United States. Since the system began in 1951, tens of millions of suggestions have flooded the executive offices. "The Japanese, " asserts Toyoda, "excel in improving things." View the full website biography of Eiji Toyoda.